The Master of Science (M.S.) 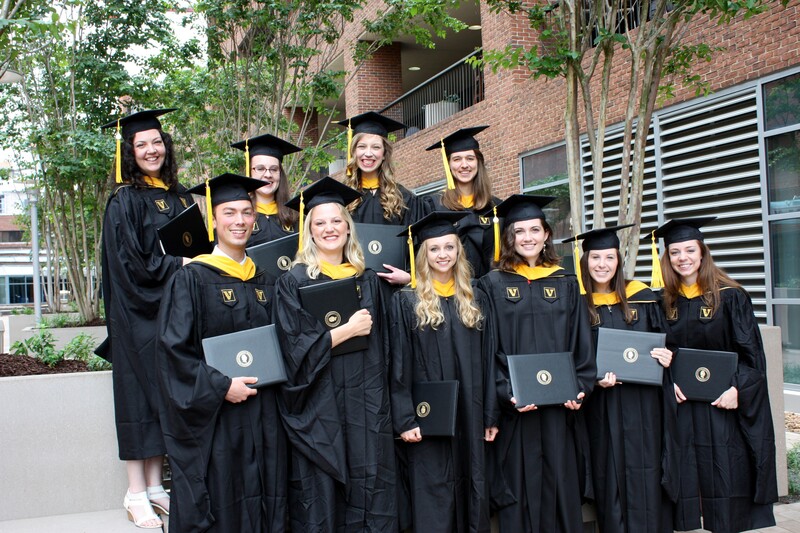 degree program in Speech-Language Pathology (SLP) is administered through Vanderbilt University School of Medicine. The M.S.-SLP program provides academic and clinical education leading to the Certificate of Clinical Competence in speech-language pathology (CCC-SLP) from the American Speech-Language-Hearing Association. The program spans two academic years (20 to 24 months). The length of the program depends upon the student’s academic background. The program covers at least five semesters (49-59 semester hours), including the summer session following the first calendar year of full-time study. Students matriculating without a background in communication sciences and disorders will require an extra semester. Throughout the program, a variety of clinical training venues are available within the Vanderbilt Bill Wilkerson Center for Otolaryngology and Communication Sciences, the Monroe Carrell, Jr. Children’s Hospital, the Vanderbilt University Hospital, and off campus. The M.S.-SLP program culminates in a ten-week clinical or research externship at a site of the student’s choosing. The curriculum and clinical practica exceed the standards set by the Council for Clinical Certification (CFCC) of the American Speech-Language-Hearing Association (ASHA). Specialty training tracks and elective courses are available to eligible students who have career interests with specialized populations (i.e., children with severe to profound hearing loss, autism spectrum disorders, feeding and swallowing disorders, school-aged language-literacy disorders). Interested students have the option of conducting a research project leading toward a master’s thesis. Students with academic backgrounds in communication sciences and disorders and related professions, such as, biomedical sciences, psychology, counseling, education and psycholinguistics are encouraged to apply. Applicants for admission must possess GRE scores consistent with Vanderbilt University’s graduate admission standards; an exemplary record of academic achievement and scholarship, a commitment to professionalism, perseverance, as well as an exceptional organizational and time management skills. The Master of Science (M.S.) in Speech-Language Pathology (SLP) program at Vanderbilt University School of Medicine is accredited by the Council on Academic Accreditation in Audiology and Speech-Language Pathology (CAA) of the American Speech-Language-Hearing Association, 2200 Research Boulevard #310, Rockville, Maryland 20850, 800-498-2071 or 301-296-5700.